Silicone free. 3 refined clays. 72h pure. Lightweight roots fluid. Free-flowing lengths. Exquisite radiance.The Science of Oily Roots and Dry Ends Oil produced from the scalp can build up causing the roots to become visibly greasy, weighing down the hair. Over-washing to combat this problem can strip the fibre leaving it dry. This results in a vicious cycle of washing. What if you could have hair that was cared for at both ends? 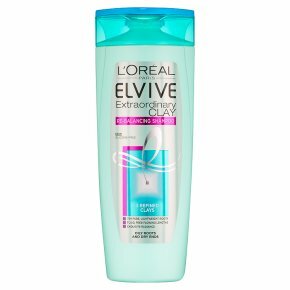 The Secret of Clay for 72 Hours of Pure Roots and Hydrated Ends For the first time, L'Oréal Paris Laboratories have combined 3 Refined Clays to create its first re-balancing range revealing perfectly balanced, beautiful hair. 1 Scalp feels deeply purified for 72 hours with freshness and light, lifted roots. 2 Dry hair feels hydrated right to the ends for fluid, free-flowing lengths. 3 Revitalises the hair with softness, shine and bounce. A delicate Clay texture for hair purity, hydration and beauty. Proven Results: Deeply purified roots, hydrated feeling ends. For perfectly balanced, beautiful hair. Directions for Use: After using Extraordinary Clay Pre-Shampoo Masque, apply onto wet hair, gently massaging into the scalp, then rinse. For best results follow with Extraordinary Clay Conditioner.